"Heads have become more complex over time," Jsaid avier Ortega-Hernández, a postdoctoral researcher from Cambridge's Department of Earth Sciences, who authored a study on the brains published in Current Biology. "But what we're seeing here is an answer to the question of how arthropods changed their bodies from soft to hard. It gives us an improved understanding of the origins and complex evolutionary history of this highly successful group." The study looked at two types of arthropod ancestors - a soft-bodied trilobite and an odd-looking creature resembling a submarine. It found that a hard plate, called the anterior sclerite, and eye-like features at the front of their bodies were connected through nerve traces originating from the front part of the brain, which corresponds with how vision is controlled in modern arthropods. The results also allowed new comparisons with another type of creature - anomalocaridids, a group of large swimming predators of the period. Researchers found key similarities, suggesting that the two groups had a common origin. Although it is widely agreed that anomalocaridids are early arthropod ancestors, their bodies are quite different. 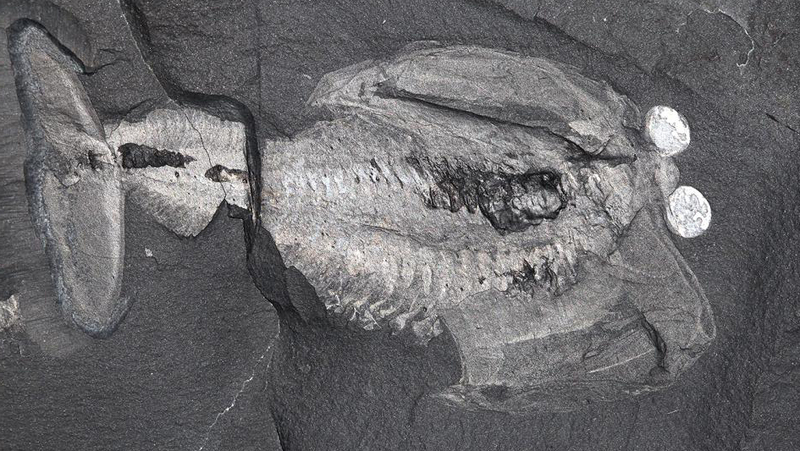 Thanks to the preserved brains in these ancient fossils, it is now possible to recognize the anterior sclerite as a bridge between the head of anomalocaridids and that of more familiar jointed arthropods. "The anterior sclerite has been lost in modern arthropods, as it most likely fused with other parts of the head during the evolutionary history of the group," Ortega-Hernández said in a press release. "What we're seeing in these fossils is one of the major transitional steps between soft-bodied worm-like creatures and arthropods with hard exoskeletons and jointed limbs - this is a period of crucial transformation." Ortega-Hernández observed that bright spots at the front of the bodies, which were found to be simple photoreceptors, are embedded into the anterior sclerite. The photoreceptors are connected to the front part of the fossilized brain, very much like the arrangement in modern arthropods. These ancient brains processed information like today's arthropods, and were crucial for interacting with the environment, detecting food, and escaping from predators. Arthropods with hard exoskeletons and jointed limbs first appeared during the Cambrian Explosion, a period of rapid evolutionary change about 500 million years ago. Before then, scientists believe most animal life consisted of soft-bodied creatures that resembled algae or jellyfish.